Pines & Highlands Ranch, CO? Orthodontic treatment doesn’t last forever! Dr. Linn will be able to determine the best treatment plan for your smile transformation, whether it be traditional metal braces or removable clear aligners, such as Invisalign, or our accelerated treatment option such as SureSmile. You can achieve your new smile up to 50% faster than traditional orthodontic treatment with SureSmile when you choose Brandon Linn Orthodontics. With our digital x-rays, you will have significantly less wait time during your Linn Smile Assessment. All of our efforts are aimed at making your appointments easy, quick, and comfortable. Click here to learn more about SureSmile. When it comes to the health and aesthetics of your smile, having experience is key. 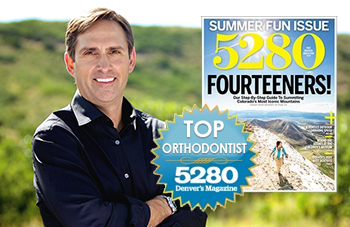 Our 5-star rated Castle Pines and Highlands Ranch orthodontist has helped transform over 6,000 smiles since 2004 in and around Castle Pines, Highlands Ranch, Lone Tree, Centennial, Littleton, Castle Rock & Sedalia, CO! This experience allows us to properly diagnose your case and expertly recommend the best-suited course of orthodontic treatment. During your Linn Smile Assessment, Dr. Linn will assess your smile and partner with you to help you get started on your smile transformation. With Brandon Linn Orthodontics, you will be smiling brightly in no time! The Complimentary Linn Smile Assessment lets you step into our Castle Pines orthodontics office or one of our Highlands Ranch orthodontic offices and take advantage of a fantastic opportunity. You will meet and talk with our friendly orthodontics team and start to learn about what we can do to help you achieve a beautiful, healthy smile. It all starts with a walk through the office and an in-depth smile assessment. If it is determined that orthodontic treatment is right for you, then photos and x-rays will be taken of your teeth to have a detailed look. If you are ready to schedule your Linn Smile Assessment, call 303.688.9617 or click here to get started! At Brandon Linn Orthodontics, our goal is to give our patients a stunning smile for a lifetime. We want you to feel completely comfortable from the moment you walk into our orthodontics office. We do this, not only by offering exceptional orthodontic treatment through extensive experience but by offering you our satisfaction guarantee. We are confident you will have nothing short of the greatest smile possible. If at any point during your treatment, you feel like you aren’t getting the results you are looking for, simply tell us and we will fix it. The time you have in your day is an important and limited resource. Here at Brandon Linn Orthodontics, we understand that your orthodontic visit should be prompt in all aspects of your appointment, from being seen in a timely manner to getting out and on with your day. Our time is not more valuable than yours, and we will put every effort into making sure we are never an obstacle in your schedule. Come by either our Castle Pines orthodontics office or one of our Highlands Ranch orthodontic offices and start your journey to your greatest smile, faster and more convenient than ever! Dr. Linn and the Brandon Linn Orthodontics team understand that using your retainer after braces is crucial to maintaining your stunning smile for years to come. To make sure there are no questions about this aspect of your orthodontic treatment, your retainer is included with the rest of your treatment, so you don’t have to worry about it. We want you to know that our commitment to your best treatment doesn’t stop when your braces come off. You will be provided with a set of retainers. If you have any questions, feel free to contact any of our friendly team members at 303.688.9617 or fill out our online appointment form here. At Brandon Linn Orthodontics, we understand that emergencies happen! Whether you’ve dislodged a bracket or bent wire, our orthodontics team is here to help you correct your concern. Our Castle Pines, CO orthodontic office and Highlands Ranch, CO orthodontic offices are pleased to offer emergency appointments for our patients experiencing discomfort. One of our missions is to protect your smile throughout the duration of your orthodontic treatment. Call 303.688.9617 to make your appointment with Dr. Linn. By choosing Brandon Linn Orthodontics for your braces and orthodontics, you are opting for a smile solution that relies on the latest advancements in modern orthodontic technology. Even on your first visit, you will have a digital x-ray taken with an I-Cat® machine that scans your head and allows our orthodontist, Dr. Linn, to have a better visualization of the current structure of your mouth. The I-Cat® Cone Beam 3D imaging system produces 100% accurate three-dimensional images in under one minute and uses 95% LESS radiation than other x-ray machines! The precision of 3D scans with the I-Cat® machine allows us to provide unparalleled orthodontic care and optimal results for all our patients. One scan provides us with more information than numerous digital x-rays. Prior to this revolutionary technology, orthodontists would typically use a Panorex, a Lateral Cephalogram (head film), and multiple periapical x-rays for diagnosis. One iCat Cone Beam scan replaces all of this technology, using the same type of radiation as other machines, only 95% less! Dr. Linn will take one 3D scan after the initial diagnosis has been made and any necessary follow-up x-rays will be a digital Panorex using the same machine. The iCat 3D scan has detected dental and other medical issues on many patients that would not have shown up on a traditional x-ray! We are proud to offer this state-of-the-art technology and our patients love having access to next-level diagnostics. Your orthodontic journey is made easy with Brandon Linn Orthodontics! Find out more about the incredibly accurate, safe, and non-invasive technology by calling one of our orthodontic offices today – we are here for you! Regardless of your insurance policy, we want to make sure that paying the balance for your braces and orthodontic treatment is as simple and easy as possible! To make sure our patients are comfortable and confident when it comes to paying for their smile transformation we offer several flexible and affordable payment options for braces and orthodontics, including OrthoFi (paid in full discounts) and 0% financing for 24 months that will take the worry out of getting braces! To learn more about the cost of braces and flexible payment options, call Brandon Linn Orthodontics at 303.688.9617. In today’s world, everyone is busy! Making the decision to get orthodontic treatment shouldn’t interrupt your entire schedule, which is why orthodontists should implement flexibility for scheduling appointments, such as same-day appointments, flexible hours, and short wait times. With today’s technology in a fast-paced world, this is a necessity for any successful orthodontic practice to run efficiently. Brandon Linn Orthodontics offers all three of these scheduling options. Our office is highly efficient, so wait times are minimal. Oftentimes, we can schedule your appointment for the same day, work around your school or work schedule. Before you know it, your braces will be off and you will be able to enjoy all the benefits of a healthy, beautiful smile. One of the ways we make it feel like your orthodontic treatment is flying by is to have a patient referral program! Our referral program gives you opportunities to earn cool prizes and help charities! Make sure to ask about our referral incentives when you visit either our Castle Pines orthodontics office or one of our Highlands Ranch orthodontic offices. We love to see our patients and prospective patients smiling, even before their braces come off. If you are ready to start your journey at Brandon Linn Orthodontics, click here or call 303.688.9617 today!